The City Pub Group owns and operates an estate of premium pubs across the southern half of England and Wales. The Group’s pub estate comprises 48 free houses located largely in London, cathedral cities and market towns, each of which is focused on appealing specifically to its local market, of which 44 are trading and others are in development. The Group’s portfolio consists of predominantly freehold, managed pubs, offering a wide range of high-quality drinks and food tailored to each of its pubs’ customers. The City Pub Company (East) PLC and The City Pub Company (West) PLC were originally founded by Clive Watson, David Bruce and John Roberts, in late 2011. The first pub began trading in March 2012, with the estate growing rapidly to 34 sites by November 2017 when The City Pub Group was formed through the all share merger of the two original companies. The City Pub Group successfully completed an IPO in November 2017, when the shares were admitted to trading on AIM. The City Pub Group leverages its sector contacts and experience to ensure it is well placed to acquire, high quality, well-located freehold or leasehold pubs. Following acquisition, it aims to improve profitability through targeted investment in each pub, incentivisation of its key employees, introducing its flexible retail strategy, dedicated marketing and utilising its centralised buying power. Since they began trading, the companies in the Group have adopted a premium liquor-led business model, which the Directors believe provides greater predictability over sales and higher margins than a food-led business model. The Directors have considerable experience of acquiring pubs, expanding pub portfolios and creating premium pub companies. This includes leading the Capital Pub Company from start-up through to flotation on AIM and its subsequent acquisition by Greene King for £93 million. Since 2012, The City Pub Group continued to acquire on average six pubs per year. In order to fund the acquisitions, the Companies raised the sum of £38 million under the Enterprise Investment Scheme and through the issue of convertible preference shares. The Group has subsequently raised a further £35 million as part of the IPO in November 2017, and a further Placing of £6.2 million of new shares in October 2018. The Group has historically traded as two separate companies, The City Pub Company (East) plc and The City Pub Company (West) plc. In April 2013, CPCW and CPCE appointed Alex Derrick and Rupert Clark, respectively, as its designated Chief Executives. Under their stewardship, both of the Companies expanded their pub portfolios further and by the end of their first full trading year (to 29 December 2013) CPCW had 6 trading outlets and CPCE had 7 trading outlets. The Companies continued to acquire, in aggregate, on average 6 pubs per year, ending 2017 with a total of 35 pubs, including a number of sites in London, Bristol, Brighton, Norwich, Southampton and Winchester. On 1 November 2017, the Group was formed through the all share merger of CPCE and CPCW by way of a scheme of arrangement of CPCW and the same time changed its name to The City Pubs Group plc. The City Pubs Group plc was admitted to AIM on 23 November 2017 and Alex Derrick and Rupert Clark are now joint Managing Directors of the combined Group reporting to Executive Chairman, Clive Watson. At this point, the Group aimed to double the size of its estate over the following three to four years. The Group’s pub estate and flexible retail strategy addresses the trend away from branded pubs and toward premium individualised pubs, each of which have a product range appropriate for their local market. The centralised infrastructure platform, comprising systems and processes as well as head office staff, enables a smooth change of ownership for the pubs which are currently in the acquisition pipeline, as well as those identified through the Group’s appraisal of both individual sites and portfolios of pubs across southern England and Wales. An independent valuation report by CBRE valued the Group’s portfolio at £73.65 million as at 11 October 2017. This valuation does not include Aragon House, a freehold pub which the Group acquired on 21 September 2017 for £7.75 million The Group had a portfolio of 35 pubs (including Aragon House, which will be trading in 2018) at that time. The Group has enjoyed consistently strong sales and EBITDA growth, with steadily increasing operating margins over the last two years. New supplier agreements are expected to further improve operating margins going forward. The management team of the Group has over 100 years’ experience in the pub industry with an excellent reputation, extensive contact base and proven skill in identifying attractive sites for an attractive price. Staff are incentivised to focus on customer service and are represented at board meetings, giving a high retention rate among key staff and a strong sense of culture. The City Pub Group is a managed pub business operating across the South of England and Wales. It has a collection of 34 unbranded free-house pubs currently trading, clustered around affluent Cathedral cities, with others in development. Its premium, wet-led offer and flexible approach give it broad customer appeal across residents, workers, students, shoppers and tourists. The Directors believe that in the premium managed pub sector, liquor sales such as craft ales, craft spirits and independent coffee brands offer higher growth potential, higher margins and higher predictability over sales than traditional beers, lagers and spirits. Food menus are also developed individually for each pub and offer high quality, freshly prepared food, providing good value for money and offering a wide range of choice. Increasingly, more healthy and vegan options are being offered in each pub to broaden the appeal to a wider range of customers. In addition bedrooms and function rooms are an increasingly important part of the revenue stream for many of the sites. The Group had 44 bedrooms at the end of 2017, with more planned in 2018. City Pub Group stands out from the crowd with its unique and premium offer. This is embedded in its culture and influences everything from site selection, food and menu design to the quality of its employees. Importantly its portfolio is built up of unbranded, wet-led pubs in high footfall areas that appeal to a broad range of customers. Each pub is centred on a high calibre level of staff that offers a relaxed, enthusiastic charming environment. The Group has a solid track record of identifying, acquiring, refurbishing and repositioning pubs to drive higher returns. Its approach is highly differentiated and combines the flexibility of the managed pub model with the entrepreneurialism of the tenanted model. This differentiated approach has been honed over management’s 100 collective years of pub retail experience. At present, the Group has 41 trading pubs and intends to continue growing the estate over the next three to four years in line with, or ahead of, our plan set at IPO. The Group already has extensive relationships with property agents specialising in the licenced trade industry and many of these relationships have been in existence for a number of years. The Group’s acquisition strategy is broken down into four key areas and the Directors believe that these areas will provide sufficient acquisition opportunities to support the targeted growth of the Group’s pub estate. Central to the Group’s acquisition strategy is buying existing pubs that are already trading well and are typically sold by private sellers. The main change is to transfer the pub’s supply contracts onto the Group’s centralised platform, quickly improving operating margins. The Group prides itself on the way it works with the existing employees in these pubs and, over a period of time, aims to integrate these employees into the Group’s entrepreneurial culture. The Group also seeks to acquire existing pubs that require modest refurbishment and improved retailing standards. Typically, the Group will target an investment of circa £250,000 to tailor the décor to the pub’s local market and improve the liquor and food offerings, as well as help the existing staff to adopt an entrepreneurial approach in managing the pub. The Group also looks to acquire sites that are either underperforming or have been closed down and which provide the opportunity for the Group to substantially refurbish and improve the product offer to better serve the tastes of the Group’s target consumers. The Group is able to target sites which are currently unlicensed but which present the opportunity to be transformed into premium trading pubs. The Group typically targets pubs and sites that produce, or are expected to produce, higher EBITDA per pub than the industry average. The Directors believe that by focusing on sites expected to produce a higher EBITDA, head office costs as a percentage of sales are reduced and this performance also enables the attraction and retention of top performing pub managers. The Group evaluates new sites by testing them against five key target markets: residents, office workers, students, tourists and shoppers. For a new site to be considered, it must address at least four of the five key target markets. The Group’s strategy is to enhance existing sites rather than redesign to a set formula. The Directors believe that an operation comprising individual quality outlets that are unbranded will trade better over the longer term. When refurbishing a pub, the Group adopts a timeless design style, which is one of high quality but is not fashionable or contemporary. A typical refurbishment is undertaken in a style which the Directors believe is long lasting and through regular maintenance to maintain the estate to a high standard, future refurbishment costs are reduced and closures of pubs for major refurbishments are minimised. The Group is continually appraising both individual sites and portfolios of pubs across southern England and Wales, developing a strong pipeline of potential acquisitions out of the large number of opportunities presented. The Group is targeting the acquisition of 8-10 pubs per annum. All acquisitions are subject to approval by the Board and a key consideration, when seeking board approval, is to recommend pubs and sites in areas which are not highly competitive. The Group has a low annual rent charge compared to its turnover (which was circa 3.4% as at 31 December 2017) and the Group intends to keep it at this level. Recruitment and retention of high quality staff is key to the Group’s strategy, both at head office and across the estate. The Group’s staff are well trained and appropriately incentivised, given their respective roles, with the focus on attracting the most suitable employees to support the growth of the Group and maintain high levels of consumer satisfaction. The Group’s localised strategy requires a certain standard and quality in its staff. The inherent ability to be engaging, intelligent and motivated are key attributes. The strategy to focus within Cathedral cities means finding the right type of staff should be easier especially as universities are central to all these cities. Finding the right people is followed by training programmes and a highly rewarding incentives package that we feel is unique in the industry. Putting its staff at the heart of the business is also reflected, with two employee representatives included at every board meeting. Growth, accompanied with the clustering strategy, means many General Managers are ‘homegrown’. This has allowed for progression to area manager in some cases. Each pub has a General Manager and head Chef on-site. The average full time equivalent staff per pub ranges from 15-20 depending on size and offer (higher for those with accommodation and greater food offer). The operational structure is highly devolved fostering a more entrepreneurial spirit that is rarely seen in larger groups. The overarching aim is to offer customers exceptional experiences, while striving to offer employees sufficient development possibilities to build a career within the Group. The City Pub Group has developed a comprehensive incentives policy with all employees participating at some level. Importantly bonuses are based on both quantitative and qualitative targets are paid out weekly, monthly, as well as annually. This is unique in the industry, in our view. While value for money is a major component, there is a key focus on a premium offer across the entire estate. Aligned with keeping the values of the pub intact, there is an aim for the pub to become a central part of the local community by incorporating local suppliers, local staff and providing several reasons for people to visit often. Shifts in consumer preferences combined with the changing profile of the high street, have blurred the lines between pubs, restaurants, cafes and coffee shops. Customers are now able to have a breakfast in a pub or dinner in a coffee shop. Menus are developed individually for each pub and offer good value across a wide range of choice. Increasingly, healthier and vegan options are being offered in each pub to broaden the appeal to a wider range of customers. The Group adopts a long-term approach with its suppliers and has maintained relationships with its major suppliers since inception. This includes contractors, professional advisers, designers and property agents, as well as food and drink suppliers. The Group has recently entered into a number of three year fixed-term supply agreements with its major suppliers. These agreements cover over 80% of the Group’s liquor purchases and are expected to generate c.£1 million in cost savings, compared to its previous arrangements, over the next three years. The Group has also recently centralised its food purchasing function and significantly reduced the number of its suppliers, which has resulted in an improvement in its purchasing terms and will enable greater economies of scale to be achieved as the pub estate grows. The Group adopts a long-term approach with its suppliers and has maintained relationships with its major suppliers since inception. In certain cases the relationships date back to the Founders’ involvement with The Capital Pub Company. This includes contractors, professional advisers, designers and property agents, as well as drink and food suppliers. The Group is very conscious of the role its pubs play in the local community and as such certain pubs offer discounts to customers who work in the public services. Charity fundraising events are often held in the Group’s pubs for organisations such as The Eve Appeal and Grenfell Tower Appeal. The Group also recognises the importance of maintaining a good relationship with its employees and as such encourages employee participation. To formalise this, in May 2016 the Company started to invite employee representatives to attend all board meetings in order to discuss matters such as staff training, incentive schemes and staff welfare. Advertising and social media are managed at head office level with Facebook, Twitter and Instagram being a focus of advertising investment. Each pub has its own website to take bookings, display menus, advertise upcoming events and give an impression of the atmosphere in the pub. The Group recently introduced the City Club where customers can sign up to and enjoy the benefits offered by the Club, such as reward cards, and will, in the future, be offered benefits with other businesses linked to the City Club. The City Club connects all pubs in the portfolio and, among other things, alerts customers to the location of other pubs in the Group’s portfolio. The City Club can be accessed via an app (the City Club App) and offers the Group the opportunity to promote awareness of the pubs in the portfolio. The Group currently has a portfolio of 44 free-of-tie pubs trading in cathedral cities and market towns across the southern half of England and Wales, including sixteen in London, eight in Cambridge, four in Oxford, three in Brighton, and two in each of Norwich, Bath, Bristol, Cardiff and Winchester, in addition to sites in Exeter, Southampton and Hayling Island, near Portsmouth. Just over half of the pubs in the portfolio are freehold and the remainder leasehold, and there are a number of other sites either acquired or in the hands of solicitors forming a strong pipeline for future development, in addition to a number of others either in negotiation or currently being appraised. The Company’s issued share capital consists of 61,302,514 ordinary shares of 50p each (“Ordinary Shares”). The Board comprises of four highly experienced Executive Directors with over 80 years’ combined experience of developing and operating pub companies. In addition, the three Non-Executive Directors also add many decades of pub and drinks industry expertise. Clive Watson ACA (57) – Executive Chairman. Clive qualified as a Chartered Accountant with Price Waterhouse in London in 1986 before joining the investment bank Manufacturers Hanover Limited where he spent three years. He joined Regent Inns PLC as Finance Director and Company Secretary in 1990. Clive left Regent Inns PLC in February 1998 and co-founded Tup Inns Limited, where he was responsible for financial and commercial matters as well as acquisitions, before becoming Chief Executive and Finance Director of Tom Hoskins PLC, an AIM listed company. Clive was founding director of the Capital Pub Company in 2000 where he served as Finance Director until 2007 and then Managing Director before becoming Chief Executive in June 2008. He over-saw the sale of the Capital Pub Company to Greene King in July 2011. Clive was appointed as Chief Executive of The City Pub Company (East) plc in December 2011 before becoming Chairman in September 2014. Rupert Clark (46) – Managing Director. Rupert has over 20 years’ experience in the running of high-volume food and liquor-led pubs, both in and outside London. Rupert was previously Operations Manager of the Capital Pub Company and was with Capital for four years. After the sale of Capital to Greene King in 2011, Rupert stayed on to ensure the smooth integration of pubs into the Greene King estate. Prior to Capital, Rupert worked as Operations Manager at The Food and Drink Group, repositioning their city bars, and at Fullers first developing The Fine Line brand and then their unbranded bars and gastro pubs. Rupert was appointed as Joint-Chief Executive of The City Pub Company (East) PLC in April 2013 becoming sole Chief Executive in September 2014. Alex Derrick (43) – Managing Director. Alex has over 15 years’ experience in running premium, independent pubs. He was previously the Operations Director of the Capital Pub Company and during his seven years at Capital helped oversee the expansion of the estate from 13 to 35 pubs. Prior to joining Capital, Alex was the Operations Manager for Jacomb Guinness Limited and The Union Bar and Grill Limited, which operated five premium London gastro pubs. Alex was appointed as Joint Chief Executive of The City Pub Company (West) plc in April 2013 becoming sole Chief Executive in September 2014. Tarquin Williams ACMA (48) – Chief Financial Officer. Tarquin has considerable experience in the managed and tenanted pub industry. He spent 16 years with Fuller Smith & Turner PLC from 1997; with the last eight years as Chief Accountant for Fullers Inns, which had an estate of circa 400 pubs. Tarquin then spent a short period of time serving as Chief Operating Officer at the Ladies European Tour running their head office based at the Buckinghamshire Golf Club. Tarquin was appointed as Finance Director of The City Pub Company (East) plc in March 2015. John Roberts (61) – Non-Executive Director. John has been involved in the food and beverage industries for over thirty-five years, with twenty-three of those years in the brewing and pubs sector. In 1994 after thirteen years with United Biscuits and before that with Britvic, John joined Courage, becoming Strategic Planning Director for the newly formed Scottish Courage. John joined the board of Fuller, Smith & Turner PLC in 1996 as Sales and Marketing Director, before then managing the Fuller’s Beer Company from 1999, initially as Beer and Brands Director, and later as its Managing Director. In addition, John has sat on a number of committees of the British Beer and Pub Association and Independent Family Brewers of Britain. John was appointed as a Non-Executive Director of the Company in December 2011. John sits on the Audit and Risk, Remuneration and Nomination Committees. Richard Prickett (67) – Senior Independent Non-Executive Director. Richard was appointed as a Non-Executive Director of the Company on 25 October 2017. Richard has considerable public markets experience, gained through numerous non-executive director roles including acting as Independent Non-Executive Director for Regent Inns Plc and the Capital Pub Company. Richard currently serves as a Non-Executive Director to Pioneer (City) Pub Company, a start-up EIS managed pub company, and City Natural Resources High Yield Trust Plc. Richard also acts as Non-Executive Chairman to Asian Growth Properties Limited and as Finance Director to Landore Resources Limited. Richard qualified as a chartered accountant in 1973 with Coopers & Lybrand and has many years’ experience in corporate finance. Richard is Chairman of both the Remuneration Committee and the Audit and Risk Committee, and sits on the Nominations Committee. Neil Griffiths (57) – Independent Non-Executive Director. Neil was appointed as a Non-Executive Director of the Company on 17th January 2018. Neil qualified as a Chartered Surveyor in 1987 and has over 30 years of experience in retail, leisure and property sectors. Neil worked at Punch Taverns plc from 2001 to 2017 holding a number of senior management roles including Chief Operating Officer, Chief Strategy Office, and Group Property Director. Neil joined Punch from Time Warner where he was International Property Director for their cinema division. Prior to that he held a number of Senior Management and Divisional Board roles at Bass Plc including Head of Property and Commercial Develop Director. Neil is a Trustee Director for the Prince of Wales initiative ‘Pub is the Hub. He is a former Council member of the British Beer & Pub Association having have sat on panels and committees for both the BBPA and Royal Institution of Chartered surveyors. Neil is Chairman of the Nominations Committee and sits on both the Audit and Risk and Remuneration Committees. James Dudgeon (71) – Company Secretary. James has been Company Secretary since 2011. He was previously Company Secretary of the Capital Pub Company. He has an accounting background. The Board has overall responsibility for the Group’s system of internal control and reviewing its effectiveness. Key elements of the system of internal control include clearly defined levels of responsibility and delegation, together with well-structured reporting lines up to the Board; the preparation of comprehensive budgets for each pub and head office, approved by the Board; a review of period results against budget, together with commentary on significant variances and updates of both profit and cash flow expectations for the period; Board authorisation of all major purchases and disposals and regular reporting of legal and accounting developments to the Board. On 13 September 2018, the board of the City Pub Group PLC (“CPG” or the “Group”) decided to apply The QCA Corporate Governance Code (2018 edition) (“the QCA Code”). The choice of code to adopt was important to us. We wanted to be sure that we would proactively embrace whatever code we adopted and maintain the highest standards of corporate governance whilst delivering growth, maintaining and dynamic management framework and building trust with our shareholders. We believe that the QCA Code provides us with the right governance framework: a flexible but rigorous outcome-oriented environment in which we can continue to develop our governance model to support our business. 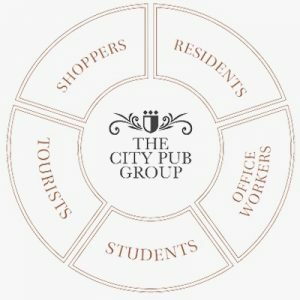 The City Pub Group is a vibrant, growing business with a clear strategy, a strong and experienced management team and a well-developed pipeline of sites with an exciting market opportunity ahead. 2017 was a pivotal year in the evolution of the City Pub Group. At the end of last October, the City Pub Company (East) Plc (“CPCE”) combined with City Pub Company (West) Ltd (“CPCW”) to form the City Pub Group plc. The Group was subsequently listed onto AIM on November 23 raising £35m at 170p. EIS shareholders also placed £11.6m of shares with new institutional shareholders. The AIM listing achieved a liquidity event for existing EIS shareholders and the Group’s financial position was significantly strengthened providing the platform for the Group to acquire further pubs and double the size of its estate to 65-70 pubs by 2021. City Pub Group is committed to maintaining the highest standards of corporate governance throughout its operations and to ensuring that all of its practices are conducted transparently, ethically and efficiently. The Company believes that scrutinising all aspects of its business and reflecting, analysing and improving its procedures will result in the continued success of the Company and improve shareholder value. Therefore, and in compliance with the updated AIM Rules for Companies, the Company has chosen to formalise its governance policies by complying with the UK’s Quoted Companies Alliance Corporate Governance Guidelines for Small and Mid-Size Quoted Companies (the “QCA Code“). We will have to provide details of it on our website and then explain how we comply with that code and include reasons where we have departed from it. This information is to be reviewed annually and the website will need to include the date on which this was last done. This rule takes effect from 28 September 2018. City Pub Group stands out from the crowd with its unique and premium offer. This is embedded in its culture and influences everything from site selection, food and menu design to the quality of its employees. Importantly its portfolio is built up of unbranded, wet-led pubs in high footfall areas that appeal to a broad range of customers. Each pub iscentredon a high calibre level of staff that offers a relaxed, enthusiastic charming environment. The Group has a solid track record of identifying, acquiring, refurbishing and repositioning pubs to drive higher returns. Its approach is highly differentiated and combines the flexibility of the managed pub model with the entrepreneurialism of the tenanted model. 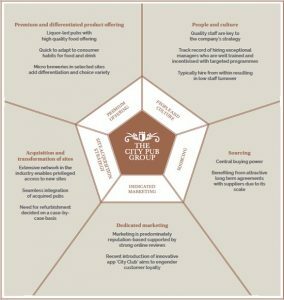 This differentiated approach has been honed over management’s 100 collective years of pub retail experience. At present, the Group has 42 trading pubs and it intends to increase the size of its estate over the next three to four years to 65-70. The Group already has extensive relationships with property agents specialising in the licenced trade industry and many of these relationships have been in existence for a number of years. Central to the Group’s acquisition strategy is buying existing pubs which are already trading well and are typically sold by private sellers. The main change is to transfer the pub’s supply contracts onto the Group’s centralised platform, quickly improving operating margins. The Group prides itself on the way it works with the existing employees in these pubs and, over a period of time, aims to integrate these employees into the Group’s entrepreneurial culture. The Group is able to target sites which are currently unlicensed but which present the opportunity to be transformed into premium trading pubs. The Group typically targets pubs and sites which produce, or are expected to produce, higher EBITDA per pub than the industry average. The Directors believe that by focusing on sites expected to produce a higher EBITDA, head office costs as a percentage of sales are reduced and this performance also enables the attraction and retention of top performing pub managers. The Group’s strategy is to enhance existing sites rather than redesign to a set formula. The Directors believe that an operation comprising individual quality outlets which are unbranded will trade better over the longer term. When refurbishing a pub, the Group adopts a timeless design style which is one of high quality but is not fashionable or contemporary. A typical refurbishment is undertaken in a style which the Directors believe is long lasting and through regular maintenance to maintain the estate to a high standard, future refurbishment costs are reduced and closures of pubs for major refurbishments are minimised. The Group is continually appraising both individual sites and portfolios of pubs across southern England and has developed a strong pipeline of potential acquisitions out of the large number of opportunities presented. The Group is targeting the acquisition of 8-10 pubs per annum. All acquisitions are subject to approval by the Board and a key consideration, when seeking board approval, is to recommend pubs and sites in areas which are not highly competitive. The Group has a low annual rent charge compared to its turnover which was circa 3.4% as at 31 December 2017 and the Group intends to keep it at this level. The Group maintains effective contact with Shareholders and welcomes contact from investors. The Directors are responsible for the maintenance and integrity of the corporate and financial information included on the Group’s website. Copies of our annual report (which includes the notice of AGM) and the interim report are sent to all shareholders and copies can be downloaded from the investors section of www.citypubcompany.com alternatively, they are available on request by writing to the Company Secretary at Essel House, 2ndFloor, 29 Foley Street, London W1W 7TH. The company secretary can also be contacted by shareholders on matters of governance and investor relations. Clive Watson (Executive Chairman) and Tarquin Williams (CFO) are the key contacts with shareholders. Twice a year, at the time of the interim and full year results, they will present to analysts and shareholders. These meetings allow the Chairman and the Chief Financial Officer to update shareholders on strategy and the group’s performance and receive feedback. As an example, at one meeting, a shareholder asked why we were opening a vegan-only site, Clive and Tarquin explained the strategy to recognise the need of this growing market and increase the range of food being offered. Additional meetings with institutional investors and / or analysts are arranged from time to time. In April 2018, Clive and Tarquin attended the Berenberg conference, talking to existing and potential investors, explaining the business model and strategy and how City Pub would deliver on it. The board supports the use of the AGM to communicate with all investors including non-institutional investors. The meeting is generally well attended and all shareholders are given the opportunity to ask questions and raise issues; this can be done formally during the meeting or informally with the directors afterwards. At the last AGM, 33 attended. The centralised infrastructure platform, comprising systems and processes as well as head office staff, enables a smooth change of ownership for the pubs which are currently in the acquisition pipeline, as well as those identified through the Group’s appraisal of both individual sites and portfolios of pubs across southern England. An independent valuation report by CBRE valued the Group’s portfolio at £73.65 million as at 11 October 2017. This valuation does not include Aragon House, a freehold pub which the Group acquired on 21 September 2017 for £7.75 million. The Group had a portfolio of 34 pubs (including Aragon House), at that time. Such matters remain under regular review to ensure we maintain a competitive edge and respond to market needs. The Group’s stakeholders include shareholders, members of staff, customers, suppliers, regulators, industry bodies and creditors (including the group’s lending banks). The Group adopts a long term approach with its suppliers and has maintained relationships with its major suppliers since inception. This includes contractors, professional advisers, designers and property agents, as well as food and drink suppliers. The Group has recently entered into a number of three year fixed-term supply agreements with its major suppliers. These agreements cover over 80% of the Group’s liquor purchases and are expected to generate c. £1 million in cost savings, compared to its previous arrangements, over the next three years. The Group has also recently centralised its food purchasing function and significantly reduced the number of its suppliers. This has resulted in an improvement in its purchasing terms and will enable greater economies of scale to be achieved as the pub estate grows. The principal ways in which feedback from the group’s stakeholders is gained is through regular meetings, review of online analytics and weekly communications. The Managing Directors meet with the Operations Managers on a quarterly basis to review strategy and performance. Feedback is given on staff, customers and suppliers, and any necessary changes to running the pub are implemented. Area Operations Managers meet quarterly with their group of General Managers. Targets are reviewed to see which sites reached them and feedback is given if any deviation. The main suppliers are met with usually on a quarterly basis and continuously reviewed to determine if the latest products are being offered to meet the market needs. Employees are able to provide feedback and raise any suggestions or issues by e-mailing the nominated employee representatives via a designated e-mail address. The representatives then meet with the Board quarterly to relay this information. Reviews written by customers via google, trip advisor, Facebook are continuously read by the Managing Director’s, Operations Managers and General Managers, and reported on at the quarterly meetings. The Marketing team provides analytics data on customer satisfaction, website visits, bookings, App sales etc. via a weekly communication to all Head Office and GM’s, and reports on a quarterly basis to the Board. The Chairman also sends a weekly e-mail reporting on best performers of the week, with rewards to those and suggestions for the weeks ahead on how to maximise sales. The Group is very conscious of the role its pubs play in the local community and as such certain pubs offer discounts to customers who work in the public services. Charity fundraising events are often held in the Group’s pubs for organisations such as The Eve Appeal and Grenfell Tower Appeal. City Pub works with local groups to aid the community and we have recently signed up with a company; Energise, for our ESOS scheme, to save energy and help the environment. We have got rid of plastic straws and are in the process of stopping bottled water and instead instilling water systems, already present in some of our pubs. https://www.somethingtolookforwardto.org.uk/– Cambridge pubs (Petersfield and Old Bike) are signed up to this, donating days out to people affected by cancer/going through chemo. We also won bronze at Old Bike Shop for sustainability: https://www.cambridgesustainablefood.org/directory/the-old-bicycle-shop/this means we impact the environment as little as possible and do a lot to recycle on site. Red Lion recently raised £19.5k for charity. The Group’s future success is substantially dependent on the continuing services and performance of the highly skilled pub managers and its ability to continue to attract and retain them. The Directors believe the Group’s culture and remuneration packages are attractive, which should assist key staff retention. The Directors are indemnified against public liability claims through Directors and Officers insurance. The continuing growth of the Group is largely dependent on its ability to identify and acquire free-of-tie, managed pubs in the South of England. If the Group is unable to find suitable acquisition targets at an acceptable price, this may have an adverse effect on the Group’s future success. The price of such pubs may be affected by interest rates, inward investment in the UK, the demand for pubs and other factors outside of the Group’s control. The Group may face competition from other organisations, which may be larger or better funded than itself, either within or outside of the pub sector, when seeking to acquire new sites. However, the Directors believe that the size of the market and the number of pubs in this area will mean that the Group will continue to be able to grow. The Group also faces the risk that acquisition due diligence does not identify all risks and liabilities. The pub industry in the UK is highly regulated at both national and local levels and pub operators require licences, permits and approvals. Delays and failures to obtain the required licences or permits could adversely affect the operations of the Group. These laws and regulations impose a significant administrative burden on each pub and additional or more stringent requirements could be imposed in the future. Each of the Group’s pubs is licensed to permit, amongst other things, the sale of liquor. Should any of the Group’s pub licences be withdrawn or amended, the profitability of any such pub could be adversely impacted. The Group has processes in place to ensure all necessary licences are obtained on a timely basis, and to monitor compliance with all relevant laws and regulations. The Group is subject to regulation in areas such as health and safety and fire safety. Whilst the Group believes it has appropriate policies and procedures in place, these may need to adapt which may require additional expenditure. Furthermore, in order to ensure the Group’s sites remain fully compliant with legislative requirements there will always be the need to maintain premises, not only generally but if an ad hoc issue arises, which again will require capital expenditure. Whilst the Group has a portfolio of 34 trading pubs (now 42), the level of EBITDA generated by each of these pubs varies with the largest pub within the portfolio generating approximately 8% of the EBITDA from pubs (EBITDA from pubs being EBITDA before head office costs) for FY17. In the event that for any reason, there was a deterioration in the operating performance of any pub generating a significantly higher than average level of EBITDA for the Group, this could have an adverse impact on the Group’s overall operating results, financial condition and prospects. It is possible that economic factors such as further reduced access to debt and tax increases may decrease the disposable income that customers have available to spend on drinking and eating out. This could lead to a reduction in the revenues of the Group’s pubs. The Group is likely to face increased competition as a source of alcohol from supermarkets and off-licences as well as other entities operating in its business sector which may have greater resources than the Group. As a result the Group could be adversely affected by the increased competitive pressures which result. However, the Directors believe that the location of the Group’s pubs, which are generally in prosperous provincial towns, means that the Group is well placed to cope with such pressures. The Government is also considering initiatives to deal with so-called ‘‘binge drinking’’. Whilst the Directors do not consider that these initiatives will be directly relevant to the Group’s pub portfolio given their planned locations and customer profile, any focus on the potentially harmful effects of alcohol may reduce sales of alcoholic beverages. The Group’s operations expose it to financial risks that include market risk and liquidity risk. The Directors review and agree policies for managing each of these risks and they are summarised below. These policies have remained unchanged from previous periods. The Group had no outstanding borrowing at year end as disclosed in note 18 of the Annual Report. These were loans taken out with Barclays to facilitate the purchase of additional public houses. The Group’s policy is to minimise interest rate cash flow risk exposures on long-term financing. Longer-term borrowings are therefore usually at fixed rates. At 31 December 2017 the Group had no borrowings, since the year end the Group has drawn down on the revolving credit facility, so is exposed to changes in market interest rates. The exposure to interest rates for the Group’s cash at bank and short-term deposits is considered immaterial. The Group actively maintains cash and banking facilities that are designed to ensure it has sufficient available funds for operations and planned expansions. The Group manages its capital to ensure it will be able to continue as a going concern while maximising the return to shareholders through optimising the debt and equity balance. The Group monitors cash balances and prepare regular forecasts, which are reviewed by the board. In order to maintain or adjust the capital structure, the Group may, in the future, return capital to shareholders, issue new shares or sell assets to reduce debt. The Company’s Board is currently comprised of four Executive Directors (Clive Watson, Rupert Clark, Alex Derrick and Tarquin Williams) and three Non-Executive Directors (John Roberts, Richard Prickett and Neil Griffiths). Each Director serves on the board from appointment until the next annual general meeting following his or her election or appointment in accordance with the Company’s Articles of Association, and thereafter. Non-executive Directors receive their fees in the form of a basic cash fee. Directors’ biographies are set out on pages 16 & 17 of the Company’s 2017 Annual Report and below. The Board is responsible to its shareholders for the proper management of the Company and meets four to six times a year to set the overall direction and strategy of the Company and to review commercial, operational and financial performance. All key operational and investment decisions are subject to Board approval. The Board considers itself to have sufficient independence. The QCA Code suggests that a board should have at least two independent Non-executive Directors. The Board considers Richard Prickett and Neil Griffiths to be independent. John Roberts has a business relationship with the Company in that he is an investor in a business which is a minor supplier to the Group, however he is considered by the Board to independent in character and judgement. Richard Prickett acts as Senior Independent Director. The four Executive Directors commit their time fully to their roles, while the Non-Executive Directors commit at least twelve days per year attending Board and Committee Meetings. Committees will meet formally not less than twice every year and otherwise as required. The Board comprises seven Directors of which four are executives and three are non-executives, reflecting a blend of different experience and backgrounds. The non-executive directors, with their impartial judgement, bring a different perspective to the Board. Their background and experience covers a wide sector of business and as such provides a well balanced mix of skills to evaluate company strategy and performance. The Directors ensure that their knowledge is kept up to date on key issues and developments pertaining to the Company, its operational environment and to the Directors’ responsibilities as members of the Board. During the course of the year, Directors may receive or review updates from various external advisers. Clive qualified as a Chartered Accountant with Price Waterhouse in London in 1986 then joined the investment bank Manufacturers Hanover Limited where he spent three years. He joined Regent Inns PLC as Finance Director and Company Secretary in 1990. Clive left Regent Inns PLC in February 1998 and co-founded Tup Inns Limited, where he was responsible for financial and commercial matters as well as acquisitions, before becoming Chief Executive and Finance Director of Tom Hoskins PLC, an AIM listed company. Clive was a founding director of The Capital Pub Company PLC in 2000 and remained on the board until the company’s sale to Greene King in 2011. Clive was appointed as Chief Executive of The City Pub Company (East) PLC in December 2011 before becoming Chairman in September 2014. Rupert has over 20 years’ experience in the running of high-volume food and liquor-led pubs, both in and outside London. Rupert was previously Operations Manager of The Capital Pub Company PLC and was with Capital for four years. After the sale of Capital to Greene King in 2011 Rupert stayed on to ensure the smooth integration of pubs into the Greene King estate. Prior to Capital, Rupert worked as Operations Manager at The Food and Drink Group, repositioning their City bars, and at Fullers first developing The Fine Line brand and then their unbranded bars and gastro pubs. Rupert was appointed as Joint-Chief Executive of the City Pub Company (East) PLC in April 2013 becoming sole Chief Executive in September 2014. Alex has over 18 years’ experience in running premium, independent pubs. He was previously the Operations Director of The Capital Pub Company PLC and during his seven years at Capital helped oversee the expansion of the estate from 13 to 35 pubs. Prior to joining Capital, Alex was the Operations Manager for Jacomb Guinness Limited and The Union Bar and Grill Limited, which operated five premium London gastro pubs. Alex was appointed as Joint Chief Executive of the City Pub Company (West) Limited in April 2013 becoming sole Chief Executive in September 2014 and was appointed as a Director of the City Pub Company (East) PLC on 25 October 2017. Tarquin has considerable experience in the managed & tenanted pub industry. He spent 16 years with Fuller Smith & Turner PLC from 1997; the last eight years there he was Chief Accountant for Fullers Inns, with an estate of circa 400 pubs. Tarquin then spent a short period of time serving as Chief Operating Officer at the Ladies European Tour running their head office based at the Buckinghamshire Golf Club. Tarquin was appointed as Finance Director of the City Pub Company (East) PLC in March 2015. John has been involved in the food and beverage industries for over thirty five years, with more than twenty of those years in the brewing and pubs sector. In 1994 John joined Courage, becoming Strategic Planning Director for the newly formed Scottish Courage. John joined the board of Fuller, Smith & Turner PLC in 1996 as Sales and Marketing Director, before then managing the Fuller’s Beer Company from 1999, initially as Beer and Brands Director, and later as its Managing Director. In addition, John has sat on a number of committees of the British Beer and Pub Association and Independent Family Brewers of Britain. John was appointed as Director of the City Pub Company (East) PLC in December 2011 and served throughout the period. John sits on the Audit & Risk, Remuneration and Nominations Committees. Richard was appointed as a Non-Executive Director of the Company on 25 October 2017. Richard has considerable public markets experience, gained through numerous non-executive director roles including acting as Independent Non-Executive Director for Regent Inns Plc and the Capital Pub Company. Richard currently serves as a Non-Executive Director to Pioneer (City) Pub Company, a startup EIS managed pub company, Non-Executive Chairman for City Natural Resources High Yield Trust Plc. Richard is also Finance Director to Landore Resources Limited. Richard qualified as a chartered accountant in 1973 with Coopers & Lybrand and has many years’ experience in corporate finance. Richard is Chairman of both the Remuneration Committee and the Audit & Risk Committee, and sits on the Nominations Committee. Neil was appointed as a Non-Executive Director of the Group on 17 January 2018. Neil qualified as a Chartered Surveyor in 1987 and has over 30 years of experience in retail, leisure and property sectors. Neil worked at Punch Taverns plc from 2001 to 2017 holding a number of senior management roles including Chief Operating Officer, Chief Strategy Officer and Group Property Director. Neil joined Punch from Time Warner where he was International Property Director for their cinema division. Prior to that he held a number of Senior Management and Divisional Board roles at Bass Plc including Head of Property and Commercial Development Director. Neil is a Trustee Director for the Prince of Wales initiative ‘Pub is the Hub’. He is a former Council member of the British Beer & Pub Association having sat on panels and committees for both the BBPA and Royal Institution of Chartered Surveyors. Neil is Chairman of the Nominations Committee and sits on the Audit & Risk and Remuneration Committees. James has been Company Secretary since 2011. He was previously Company Secretary of the Capital Pub Company. He has an accounting background. Responsibilities include handling the director’s registrar, taking minutes, filing SHO1’s and dormant companies accounts, application/cancellation of directors, maintaining share dealings code, maintaining the insiders list. The Board has not carried out a formal board evaluation process since IPO as it was only admitted to AIM in November 2017. However, in line with best practice and the newly applicable requirements of the QCA Code, the Board intends to undertake an annual evaluation process of the Board, the Chairman and the individual Committees and Directors. The Board may utilise the results of the evaluation process when considering the adequacy of the composition of the Board and for succession planning. Succession planning is also discussed at the nomination committee. Each employee who joins the group is given a company handbook, covering company guidelines and ethics, and undergoes an induction at site. Growth, accompanied with the clustering strategy, means many General Managers are ‘homegrown’ and hired from within the Group. This has allowed for progression to area manager in some cases. Each pub has a General Manager and head Chef on-site. The average full time equivalent (FTE) staff per pub ranges from 15-20 depending on size and offer (higher for those with accommodation and greater food offer). The operational structure is highly devolved fostering a more entrepreneurial spirit that is rarely seen in larger groups, encouraging General Managers to manage their pubs as their own business with individuality while meeting the group’s high standards of quality and service. With retention of staff becoming increasingly important, the Board believes that the Group is at the forefront of the industry in rewarding its employees. In 2015 the Board put in place an innovative Profit Share Scheme so that all employees could share in the Company’s success. As a result of the Employee Profit Share Scheme, employees who had been with the Group since 1 January 2017 were each paid £750 representing an increase of over 30% on last year’s payment. By sharing up to 3% of the Group’s EBITDA less bank interest we continue to build and retain a motivated and incentivised workforce. Customer satisfaction is monitored via analytics from google, Facebook and trip advisor to ensure that the Group’s high standards are being met from a Customer Service and general point of view. Clive Watson, as Executive Chairman, leads the Group from the front. Clive along with Tarquin Williams, Chief Financial Officer, meet with shareholders and investors on a regular basis. As well as being Chief Financial Officer, Tarquin handles any questions or feedback from shareholders via e-mails or calls. Rupert Clark and Alex Derrick, Managing Director’s, oversee the running of the pubs, visiting them on a regular basis, meeting with the Operations Managers and Head Office management team, on no less than a quarterly basis. The acquisition of pubs is reserved for the Board along with the long term strategic plans. The Board meets at least quarterly to review, formulate and approve the Group’s strategy, budgets, and corporate actions and oversee the Group’s progress towards its goals. In accordance with the best practice, the Group has established Audit and Risk, Remuneration and Nomination committees with formally delegated duties and responsibilities and with written terms of reference. From time to time separate committees may be set up by the Board to consider specific issues when the need arises. The Audit and Risk Committee will assist the Board in discharging its responsibilities, within agreed terms of reference, with regard to corporate governance, financial reporting and external and internal audits and controls, including, amongst other things, reviewing the Group’s annual financial statements, reviewing and monitoring the extent of the non-audit services undertaken by external auditors, advising on the appointment of external auditors and reviewing the effectiveness of the Group’s internal controls and risk management systems. The ultimate responsibility for reviewing and approving the annual report and accounts and the half yearly reports remains with the Board. Membership of the Audit and Risk Committee compromises Neil Griffiths, John Roberts and Richard Prickett and it is chaired by Richard Prickett. The Audit and Risk Committee will meet formally not less than twice every year and otherwise as required. The Remuneration Committee is responsible, within agreed terms of reference, for establishing a formal and transparent procedure for developing policy on executive remuneration and to set the remuneration packages of individual Executive Directors. This includes agreeing with the Board the framework for remuneration of the Executive Directors, the company secretary and such other members of the executive management of the Group as it is designated to consider. It is furthermore responsible for determining the total individual remuneration packages of each Executive Director including, where appropriate, bonuses, incentive payments and share options. No Director may be involved in any decision as to their own remuneration. The membership of the Remuneration Committee comprises Neil Griffiths, John Roberts and Richard Prickett and the committee is chaired by Richard Prickett. The Remuneration Committee will meet not less than twice a year and at such other times as the chairman of the committee shall require. The Nomination Committee will have responsibility for reviewing the structure, size and composition of the Board and recommending to the Board any changes required for succession planning and for identifying and nominating (for approval of the Board) candidates to fill vacancies as and when they arise. The Nomination Committee is also responsible for reviewing the results of the Board performance evaluation process and making recommendations to the Board concerning suitable candidates for the role of senior independent director and the membership of the Board’s committees and the re-election of Directors at the annual general meeting. The membership of the Nomination Committee comprises Neil Griffiths, John Roberts and Richard Prickett and the committee is chaired by Neil Griffiths. The Nomination Committee will meet not less than once a year and at such other times as the chairman of the committee shall require. The Company places a high priority on regular communications with its various stakeholder groups and aims to ensure that all communications concerning the Company’s activities are clear, fair and accurate. The Company’s website is regularly updated. The Company’s financial reports, including the 2017 Annual Report, can be found in the Shareholder Documents section of the Company’s website. Notices of General Meetings of the Company can be found in the Shareholder Documents section of the Company’s website. The results of voting on all resolutions in future general meetings will be posted to the Company’s website, including any actions to be taken as a result of resolutions for which votes against have been received from at least 20 per cent of independent shareholders. Our Mission is to be recognised as the best employer in our industry. We want to be the company that everyone wants to work for and other companies aspire to be like. We recognise that it is through all of the people that make up our diverse and inclusive culture, that this will be achieved. Everyone has the opportunity to have an impact and every contribution is highly valued. We welcome the opportunity to publish our Annual Gender Pay Report and share the initiatives and actions we are taking to close the gender pay gap. There are approximately 640 employees in the business. This group includes our head office, operation managers, directors, general managers, head chefs and all other site level roles. The mean hourly pay gap is 10.5% and the median hourly pay gap is 2.1% higher for men. These gender pay gaps result from the types of roles which men and women have historically held and the salaries that these roles attract. In effect, we have a higher number of men in roles that pay more, including senior managers, general managers and head chefs. We are not alone in this and understand that this is an issue throughout our industry. That said, we believe we compare well with other comparator organisations. The average UK mean differential is 17.9%. However, we are not complacent and have introduced a number of initiatives, actions and programmes to reduce our gender pay gap. Our ambition is to close the gap. To achieve this, we are committed to delivering initiatives to improve how we attract, engage and develop women as well as other under-represented groups. We are investing in development opportunities for our people. We have launched a number of development programmes to prepare internal candidates for promotion. Our Assistant Manager Development Programme has been running for four years with women accounting for just over half of the attendees, with most having been promoted to new roles. Our Senior Chef Development Programme has been running for a couple of years and we also have our Chef Academy and hope that many of its participants going forward will be women, as currently head chef roles are predominantly held by men. This statement is made pursuant to section 54(1) of the Modern Slavery Act 2015 for the financial year ending 31 December 2018 and sets out The City Pub Groups actions to understand all potential modern slavery risks related to its business and to put in place steps that are aimed at ensuring that there is no slavery or human trafficking in its own business and its supply chains. The City Pub Group PLC operates a growing portfolio of pubs, hotels and brew houses in the UK. These are run by highly trained managers whose activities are overseen by an experienced operations team and a head office in Central London. The group monitors and audits to ensure best practice in relation to all of its employees. As part of the pub industry the group recognises that it has a responsibility to take a robust approach to slavery and human trafficking. The group is absolutely committed to preventing slavery and human trafficking in its corporate activities, and ensuring that its supply chains are free from slavery and human trafficking. The group makes it clear to employees the actions and behaviour expected of them when representing the group. The group strives to maintain the highest standards of employee conduct and ethical behaviour. The group is committed to ensuring that its suppliers adhere to the highest standards of ethics that they provide safe working conditions where necessary, treat workers with dignity and respect, and act ethically and within the law in their use of labour. The group uses only specified, reputable employment agencies to source labour and always verifies the practices of any new agency it is using before accepting workers from that agency. Our supply chains include the sourcing of finished and raw materials, principally related to the provision of food and drink. • To inform all our staff, workers and suppliers of our policy. • To deliver training to relevant employees and workers within our business via our on-line training tool for Modern Slavery. • To distribute this statement to all our suppliers so they are informed of our policy. To highlight a zero tolerance stance on the discovery of any modern slavery and human trafficking in their supply chains and to advise our expectations of them in this regard. • To request details from our suppliers of any discovery of modern slavery and human trafficking within their supply chain. • Undertake an annual audit to ensure all our related processes are in place and are being adhered to. To have in place a whistleblowing policy to encourage members of staff to report concerns about wrongdoing and which offers suitable protection for whistle-blowers. This statement was approved on Tuesday 19th March 2019 by the organisation’s Board Director who reviews and updates it annually. This page includes links to information that is being disclosed for the purpose of Rule 26 of the AIM Rules for Companies – ‘Company Information Disclosure’.  This website is owned and hosted by The City Pub Group plc. This information was last updated on the 9th of April 2019.